Publishers may be excited about revenue possibilities on the iPad, but as Time Inc. is learning, the iTunes store isn’t always generous with media providers. Apple encouraged the publisher to create iPad specific applications when the device launched this year, but according to MediaMemo, the company is currently preventing Time magazine from selling subscriptions through iTunes. Apple’s approach to subscriptions is one that could quickly hobble publishers’ revenue prospects on the iPad. 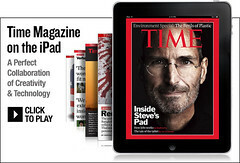 Time magazine was one of the first publishers to get on the iPad bandwagon, and though some were disappointed with the results, the publisher invested plenty of resources into creating an iPad specific product when the device launched — at Apple’s behest. Now, the company is having trouble selling subscriptions on the device. manage subscriptions for its iPad apps — much to Time Inc.’s surprise. So far, no other publisher has been able to sell subscriptions through the iTunes store either. Executives at Time Inc. are apparently “going nuts” over the situation, at one point considering pulling their app from the store altogether. Rightfully so. Many publishers were anticipating that the iPad could turn around their dwindling revenues. But they will need to iron out subscription issues before they can start bringing in consistent earnings on the device. specific issues they want, rather than subscribing annually, it could cut out a major chunk of revenue for the magazine business. They’re specifically not denying the possibility of subscriptions. If customer data is going to be retained by the digital devices, publishers will be in trouble. No matter how many people are willing to pay more for publications in the mobile environment. Stephen Fry, a couple of weeks ago, decided to stop using Twitter. He was offended by one of his many followers calling his tweets “boring”. Thankfully, he is back and even though he was annoyed by the comment he has since DM’d the chap who made the criticism, and we are led to believe everyone is happy again and normal service has been resumed. In a similar, but much less grander scale, I was nominated as “Pr*ck of the Year” on Twitter; have being associated with a pregnant goldfish; and had both my intelligence and parenthood brought into question. This was all down to a blog post (not on Econsultancy I might add) in which I had written about how a political party was using Twitter at their party conference. Many organisations have been on the receiving end of similar comments, which stick around for sometime on the web. But is there anything that organisation can do to tap into this behaviour and turn it to their and their customers’ advantage? 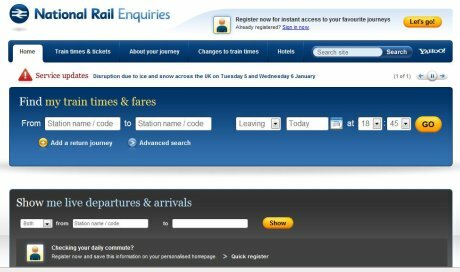 National Rail Enquiries relaunched its website last month, giving the site a much needed makeover. The site was redesigned by Fortune Cookie, and at first glance, seems to be a massive improvement on the old version with a fresher, cleaner look. How well does it perform for users though? It’s been a few days since the controversial Digital Economy Bill got the final approval from Parliament, now it only needs Royal Assent to become law. Despite a concerted and impressive online lobbying campaign, it seems that party politics was more important than Twitter outcry. But now the dust has settled the time has come to give the bill and all its last minute amendments some scrutiny. One thing that immediately sprung out to me on reading the bill was its assumption that IP address equates to an individual.